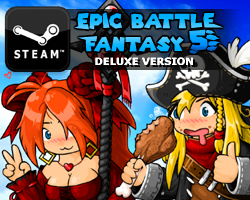 Hey guys, Epic Battle Fantasy 5 now has a “Coming Soon” Steam page! Please follow the game and add it to your wish-list, so it gets ranked above other stuff. (and obviously buy and review it when it comes out!) EBF5 will *probably* release on Steam first, for $15, with the free web version coming a few weeks later. The steam version adds about 33% more content, in the form of super hard optional dungeons, which includes the evil player battles. In other news, the EBF Discord server now has new creative channels, including: Misc Art, Lego, and Minecraft. The EBF-Fanart channel has been quite popular so far, so if you’re a creative person and want to chat with others about stuff you’ve made, check it out. This entry was posted in Epic Battle Fantasy 5, Site News on August 11, 2018 by Matt Roszak. Evil NoLegs is the best battle I’ve ever made. I hope you’re efforts will pay off even more than you expect them too! Will the game be put on Kongregate and if it is will we be able to buy the bonus content on there? Matt , on the free web version , we will can buy the extra content like the battle mountain on Kongregate , or this extra content is exclusive for the steam version? This sounds awesome! 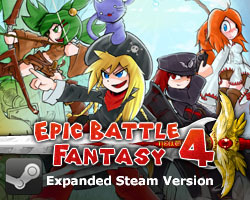 One question though–will there be an expansion pack for the web version like Battle Mountain for EBF4? I would love to play all the extra content but I can’t buy your games on Steam because they’re not Mac-compatible. I’d happily spend the money on the web version. Yeah, you can get the full version on Kongregate too. There will be a simple work-around for getting the Steam version working on Mac – but a few features won’t work, like Steam achievements. I’ll write more about that later. I am so hyped for this game! I’m probably going to use my birthday money to buy the steam version for my best friends and I. This’ll be the first installment that I share with others. I must capture every foe. I know you’ve strayed slightly from the idea, but will there be dialogue changes in epic mode compared to the other modes? I’m planning on playing the game fully blindly on epic, and was wondering if I’d miss out on any differences. Thanks for making this game and the others in the series. I know it hasn’t been too profitable, so I’m glad you’re starting to get a steady income on patreon. Hope to support you in the future . Will it be on Gog.com? I want to give you money, but I have issues with Steam. Probably, but not right away. I remember you commented that you will make a post about localization soon, but it’s been like 2 months I guess? So I would like to hear some of information about it. In case you still want another language please reply or email me. It’s still on my to-do list! I’ll get there eventually. My first time buying a steam game and a game from Matt, can’t wait for it to be on steam! Can anyone spare 15 dollars? I am a big fan of the saga. I love this game and I hope I can put my language into Portuguese because I’m Brazilian. HYPE! I just got a job too, so now I will be able to buy it one release! Or at least a couple weeks after release. All depends on the day it is lol.